Why Marijuana Gives You the "Munchies"
If you’ve ever smoked marijuana, then you’ve probably had some experience watching all three Lord of the Rings movies while eating the most delicious steak you’ve ever had owing to the fact that you decided to cover it in peanut butter and jelly. It is at this point that you might find yourself wondering why marijuana gives you the munchies. The answer appears to be a combination of a few different things, primarily an increase in your ability to smell, which in turn makes your food taste better; an upsurge in the release of a neurotransmitter, Dopamine; and through the complex mechanism of how the human body deals with hunger, the production of an appetite stimulating hormone ghrelin. So how does marijuana accomplish all this? Marijuana, and its active ingredients, known as cannabinoids, affect the brain in a number of ways. For instance, the cannabinoid that gives us that memory-killing-high is Tetrahydrocannabinol (THC). There are at least 85 separate cannabinoids in marijuana, all exhibiting varied effects within the body. To better understand the role of these in feeling famished, let’s look at what normally stimulates our appetite. The body uses several complex mechanisms to regulate hunger and subsequent feeding. Those mechanisms aren’t yet fully understood. However, what we do know is that hunger has been shown to be a two part mechanism that flip-flops when the body senses a decrease or excess in energy stores. When it senses a deficit, it triggers the release of ghrelin. This hormone is released by the GI tract and stimulates your hypothalamus in the brain to increase hunger. Interestingly, it also affects an area of the brain known as the Ventral Tegmental Area (VTA), which helps in the release of the feel-good neurotransmitter dopamine. Conversely, when there’s an excess in energy stores, fat cells release the hormone leptin. This stimulates the hypothalamus to inhibit hunger. Leptin has also been shown to affect the VTA, thus, also affecting dopamine release. Additionally, leptin counteracts the effects of another neurotransmitter, anandamide. Anandamide is another potent hunger stimulator that binds to the same receptor sites as THC- specifically, cannabinoid receptor type 1 or CB1. 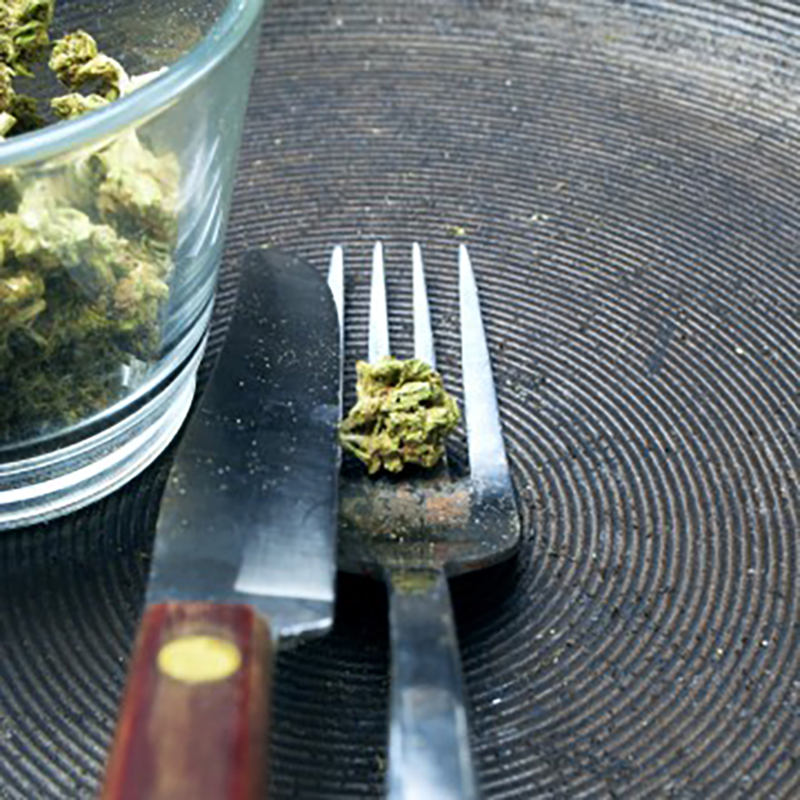 So less leptin equals feeling more hungry when THC has bound itself to anandamide receptors. THC itself has many effects within the body. It produces euphoria, analgesia, sedation, and memory as well as cognitive impairment. It reduces incidences of vomiting and, as is the subject of this article, stimulates appetite. It does all this by mimicking the body’s natural endocannabinoid system. This system has receptor sites throughout the central and peripheral nervous system and is responsible for regulating the aforementioned physiological processes- hunger being one of them. So, in the case of Maryjane-munchies, the hormones and neurotransmitters released causes your body to think you’re starving. A 2014 study showed one of these mechanisms also involves increasing your ability to smell, with THC binding to receptors in your main olfactory bulb (MOB). More technically, the authors of said study stated, “Local pharmacological and genetic manipulations revealed that endocannabinoids and exogenous cannabinoids increased odor detection and food intake in fasted mice by decreasing excitatory drive from olfactory cortex areas to the MOB”. Similar receptor sites in the hypothalamus also get stimulated by THC and cause the release of the hormone ghrelin. Ghrelin acts on the hypothalamus to increase hunger and at the same time, helps prepare your GI tract for food intake. It does this by increasing gastric acid production and motility- basically digesting and moving food through your GI tract faster. In the end, smoking marijuana makes your sense of smell better; you feel like a million bucks because your body is releasing more dopamine; and you feel hungry because of ghrelin release and the attachment of THC to anandamide receptors combining to mimic the same feelings you get when you’re deprived of food. The combination of all these things makes you want to eat like an unsupervised kid with the keys to the candy store. And when you do, the food tastes amazing! So the next time you find yourself smoking some Maui-wowie and you can’t seem to find enough Cheetos to mix with your bowl of cereal, you’ll know exactly why it tastes so good. Some people said to some degree smoking tobacco has the opposite effect for inducing hunger. As they claimed one or two sticks of cigarettes could delay their lunch/eating need.